Bioservice companies are part of the rich fabric of the life sciences in the Western Switzerland region, providing valuable expertise and knowhow. Bioservices span the full business range from clini cal research organisations (CROs) to next gen eration sequencing (NGS), through laboratories, clinical development and intellectual property consultants, to legal and financial specialists. The BioAlps region offers all the services inherent in bringing a product from idea to market, within easy reach. THE STRENGTHOF THE WESTERN SWITZERLAND REGION LIES INITS TIGHTLY KNIT COMMUNITY, AS WELL AS THE WIDE-RANGING INTERNATIONAL EXPERIENCE OF BOTH SCIENTISTS AND PROFESSIONALS INTERACTING WITH THE ALL SERVICES. The strength of the Western Switzerland region lies in its tightly knit community, as well as the wideranging international experience of both scientists and professionals interacting with technology transfer offices, intellectual property consultants, manufacturing, research and clinical services hosted by the cluster. The academic life sciences core facilities in Geneva, Lausanne and Neuchâtel comprise state-of-the-art imaging Bioservices A pro­cient network of knowhow to grow international markets ing, genomics, bioinformatics, proteomics, animal models, clinical and epidemiological studies, biomolecular screening, flow cytometry, protein expression and chemical analysis. The University Hospitals of Geneva, Lausanne and Bern participateinnumerous clinical trials sponsored by Swiss and international companies. All the academic institutions encourage innovation, and several have set up innovation parks to promote start-ups and spins, such as the Innovation Park (PSE) in the Ecole polytechnique fédérale de Lausanne (EPFL). Other innovation parks such as Eclosion in Geneva, Y-Parc in Vaud, Neode in Neuchâtel, and the Ark in Valais are sponsored by the cantons. The life science industry has access to Contract Research Organisations (CROs) in the BioAlps cluster, such as Frimorfo, SOCAR Research and Covance, which provide the full range of services from pre-clinical research to large scale international clinical trials. Contract Manufacturing companiessuchas Baccinex,BASFor Lonza each have a specialised area of activity,o‑eringthe life science industry world-class research, development and manufacturing from preclinical to commercial quantities. Beyond such multinational service companies, the BioAlps region also hosts intellectual property, patent, merger and acquisition, legal, financial and other experts and consultants, spanning disciplines and technologies for the greater benefit of the life sciences. At the same time, start-ups such as Sophia Genetics are leveraging the new opportunities that next generation sequencing (NGS) offer, while more mature companies such as GeneBio offer Mass Spectrometry characterisation of proteins and small molecules as well as proteome imaging. Managed by Dr Ursula Bausch, Baccinex was founded in 1999 in the Canton of Jura and GMP certified in 2004. 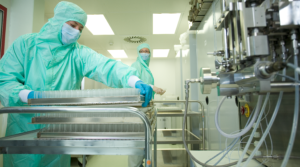 Specialised in freeze-drying and liquid sterile dosage forms for clinical trialsfor biotech and pharmaceutical development companies, Baccinex operates as a contract manufacturing organization for aseptic filling (vials and ampoules), lyophilization, terminal sterilisation, clinical packaging (randomized labelling), quality control release testing, stability studies(and stability storage according to ICH conditions), GMP storage, and development activities (scaleup, formulation, freeze drying cycle development, GMP consulting). The company has a strong expertise in scaling up projects for commercialisation, notably in fill/finish and lyophilisation of small molecules and biological productsin vials and ampoules. Baccinex’s facilities and cold storage allow GMP storage of primary materials and finished products. Baccinex processes about 50-60 different clinical projects each year and produces products for commercialization too. The company’s geographic location in the BioAlps region enables it to organise worldwide shipments of samples, finished products or clinical trial supplies. From idea to worldwide markets, the BioAlps region hosts research institutions, teaching and research hospitals, technology centres, service companies and expert consultants who all provide an environment conducive to research and development. The “can do” attitude of entrepreneursto harness the wide array of expertise offers unparalleled prospectsfor those in search of opportunity.